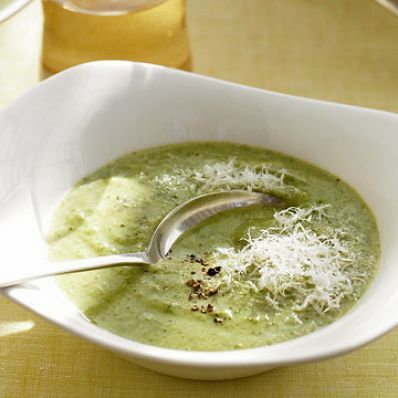 Purchased pesto seasons this creamy broccoli soup with basil. Serve it with a sandwich or salad for a light meal or as a first-course. 1 of 4 Trim tough ends off scallions and discard; chop scallions including remaining green. Heat butter in a large pot over medium heat; add scallions and cook about 3 minutes, stirring until soft. 2 of 4 Add broccoli, potato, broth and 4 cups water; bring to a boil, then reduce heat to medium and simmer, with cover ajar, for 20 minutes. Stir in peas and pesto; continue cooking until broccoli is very soft, about 4 more minutes. 3 of 4 Remove soup in batches to a blender and blend until very smooth. Return to pot; stir in Fontina cheese, salt, pepper and cream. Can be cooled and refrigerated, covered, for up to 1 day. 4 of 4 To serve, gently reheat soup over low heat, stirring in 1/2 cup water if too thick. Serve topped with Parmesan.